Over the past week tens of thousands of pounds has been spent on Facebook adverts promoting a No Deal Brexit. It is not possible to determine who is funding these highly targeted advertising campaigns, despite the tech giant introducing new regulations intended to improve the transparency of political messaging. 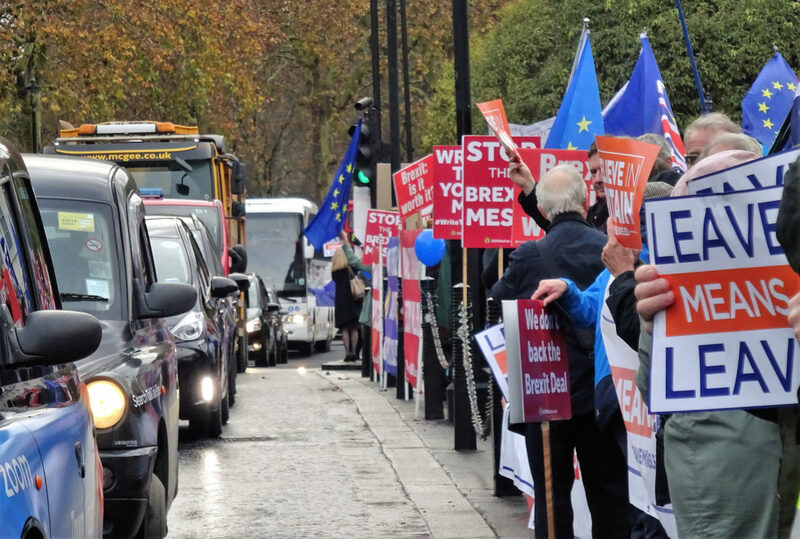 Over the seven days to last Saturday, spending by campaigners pushing for a No Deal departure from the European Union far outstripped that of anti-Brexit activists. Some of these paid-for Facebook adverts described pro-EU MPs as “traitors” and “globalist scumbags”. A single pro-Brexit group with almost no public presence spent almost £50,000 on Facebook. 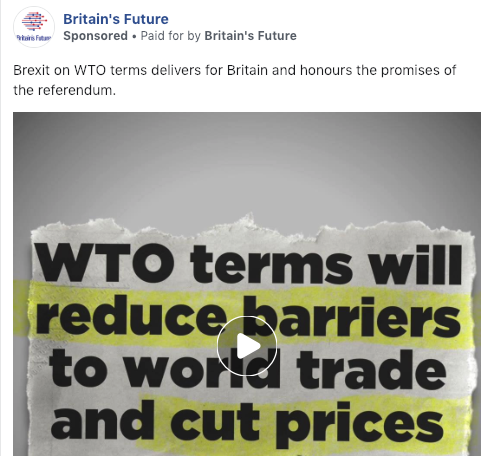 Britain’s Future – which does not declare its funders and has no published address – is running hundreds of very localised targeted ads pushing for No Deal. Some of the adverts claim that a No Deal Brexit “will reduce barriers to world trade and cut prices”, a claim contradicted by most economists. Britain’s Future has also run over 100 adverts in the last week urging voters in specific Labour constituencies to write to their MP. 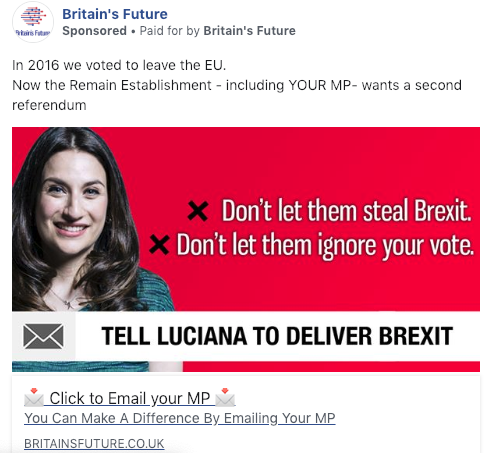 These highly targeted adverts include messages such as “Don’t Let Them Steal Brexit” and include a link for voters to email their MP. Politicians have reported receiving a significant number of pro-No Deal messages in recent weeks. Over the past week, anti-Brexit groups have spent far less money on Facebook adverts than pro-No Deal outfits, reversing an earlier trend that has seen generally anti-Brexit groups spend more money on Facebook since last October. Over the last four months, Britain’s Future has spent more than £200,000 on Facebook ads. During the same time period, the People’s Vote and Best for Britain campaigns spent £266,369 and £183,943, respectively. Both groups publish details of some supporters but do not disclose all their funding or donors. While anti-Brexit spending has slowed down, adverts pushing a No Deal Brexit have spiked dramatically in recent weeks. Britain’s Future has spent more than £110,000 on Facebook ads since mid-January. The source of the funding for this huge ad push is unclear. The only person publicly identified with the group is Tim Dawson, a former Two Pints of Lager and a Packet of Crisps scriptwriter. Dawson is listed as editor on Britain’s Future’s website. In November, Dawson told the BBC that he was “raising small donations from friends and fellow Brexiteers” after it was reported that a paid for Britain’s Future advert topped Google searches for “what is the Brexit deal” ahead of the UK government’s own site. Dawson has yet to respond to queries from openDemocracy about the source of his funding. Dawson has written for the Spectator, Spiked and other right-wing publications. 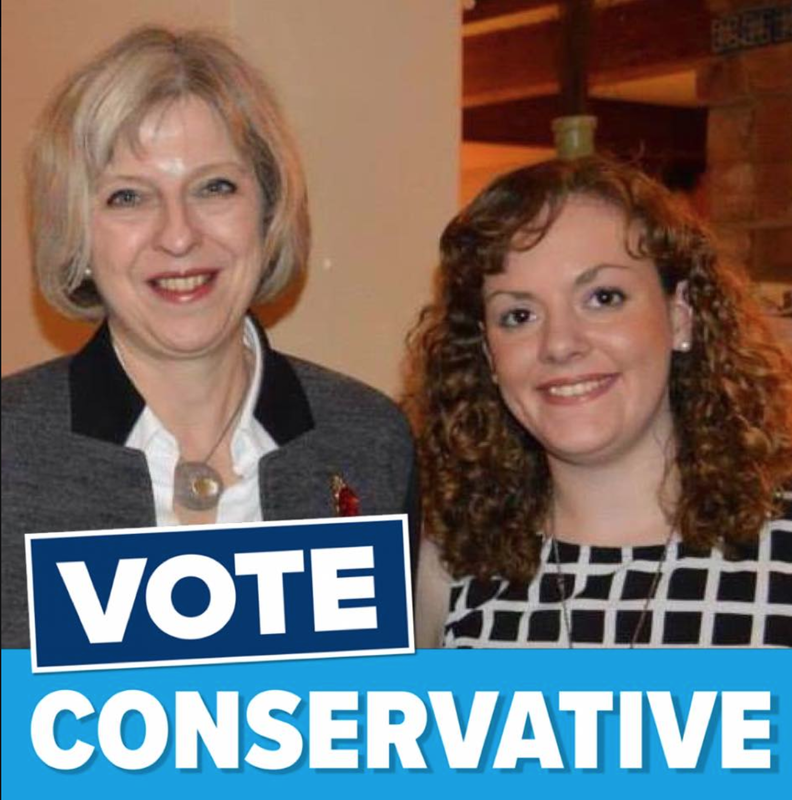 In last year’s local election, he ran as a Conservative candidate in Hulme, in Manchester. He finished a distant sixth. During the 2016 EU referendum Vote Leave and other campaigns spent almost £4m on social media adverts, including erroneous warnings that Turkey was joining the EU. Britain’s Future’s adverts are far more geographically targeted than Vote Leave’s, and appear to be focused on influencing Labour MPs not to back Theresa May’s Withdrawal Bill on February 14, which would increase the chances of a No Deal Brexit. Some of the paid for pro-Brexit ads on Facebook are more sinister. A group called ‘Brexit Defence Force’ paid hundreds of pound for adverts that included messages about “remoaner Globalist scumbags” and calling for a No Deal Brexit. In one advert posted this week (below), Speaker John Bercow was described as “a Saboteur amongst us” and a “nasty little globalist scumbag”. Above a cartoon image of a witch in a long black hooded cloak a message says “Burkow must go”, apparently in reference to a burkha. It is impossible to find out who is actually paying for these adverts. Under rules introduced by Facebook last year, all political advertising in the UK has to be labelled and those placing the adverts to verify they are living at a UK postal address. But Facebook’s news rules, introduced following concerns about social media campaigning during the Brexit referendum and the 2016 US presidential election, do not force an advertisers to declare the ultimate source of the money for any political campaigns. For groups such as ‘Brexit Defence Forces’ and others it is simple to place adverts without having to disclose who is actually paying for them. 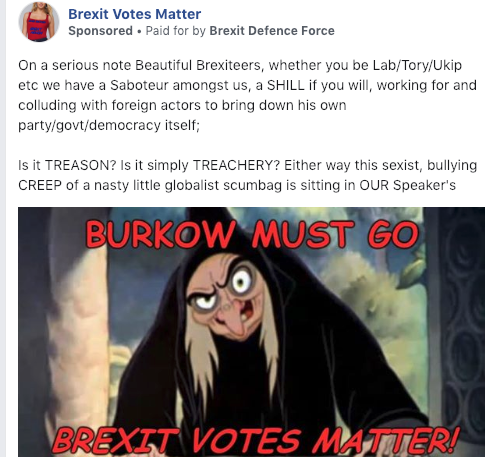 Last month, Facebook removed threats of violence against pro-EU MPs made in response to a paid-for Brexit Defence Force advert. But Facebook ruled that the advert – which accused anti-Brexit MPs of “treason” – did not breach its community standards. As well as paid for ‘no deal’ adverts, many popular pro-Brexit Facebook sites have shared images depicting the European Union as Nazis and Theresa May as a traitor. Others have even used iconography from 1930s Germany to spread a hardline pro-Brexit message. Another obscure anti-Brexit outfit, We are the 52%, spent more than £4,000 over the last seven days. We are the 52%, which has spent almost £25,000 on Facebook ads since October, has also been pushing for a No Deal Brexit. We are the 52% appear to be affiliated with Nigel Farage’s Leave Means Leave. The only person publicly connected with the group is former Vote Leave activist Theodora Dickinson. Dickinson (below) also separately runs a website that offers political communications services including “social media solutions for candidates and elected representatives”. openDemocracy has contacted We are the 52% to ask what is the source of the funding for its Facebook adverts but has yet to receive a response. Labour’s Ben Bradshaw said: “This is the latest example of shady groups that keep their identity secret pushing misleading and factually inaccurate hard Brexit ads on social media. We have no idea who these people are or where their money comes from. Liberal Democrat MP Tom Brake said: “There is a clear agenda from a clique of comfortable businessmen and donors to block attempts at preventing a chaotic No-Deal scenario – the very worst Brexit outcome. Sam Jeffers, co-founder of Who Targets Me, said: “People spending large sums to influence voters and MPs should be transparent by default. Equally, Facebook could implement stronger rules to force greater transparency on organisations who want to reach people through its service. This piece was first published by openDemocracy on February 5.